Journalist, novelist, poet, artist and art critic, essayist, theologian, propagandist, philosopher, and creator of the wily old Father Brown - G. K. Chesterton is one of the most beguiling authors of the early twentieth century. When asked to perform a lecture tour in 1921, Chesterton was in a slump of depression. He had recently lost his brother to the First World War and his wavering faith in the face of the horrors of the conflict only intensified his malaise. 'What I Saw in America' tells us as much about the author and his particular views as it does about his destination. Indeed, Chesterton's personalised observations - his aversion to imperialism, capitalism, Anglo-Americanism and his commitment to democracy and fraternity - are distinguished by the piercing wit for which he is famed. Many of Chesterton's reflections are timeless and startlingly prescient. He was highly critical of both the naive immigration policies and the grinding dehumanisation brought about by the growth of the economy. Nonetheless, he was enthralled by the glorious ideals of the nation - founded on principles of equality, democracy and freedom - even if the essence of these ideals had been lost somewhere along the way. 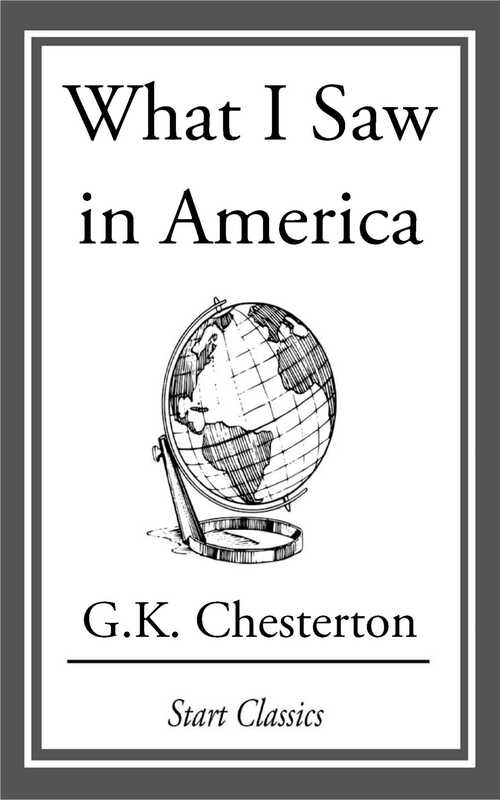 'What I Saw in America' ranks among the finest of Chesterton's works, containing all of the author's virtues and vices: his wry humour, sympathy and intelligence playing devilishly against an irrepressible mischievousness.